Transfer Talk | Listen Free on Castbox. 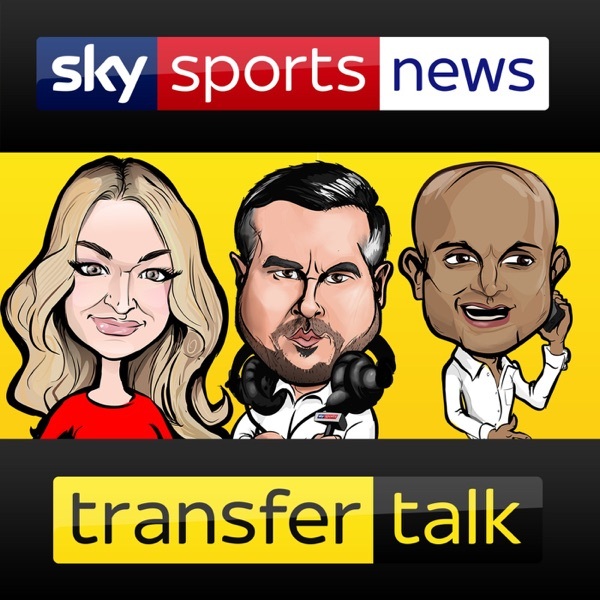 Transfer Talk is a podcast from Sky Sports News which will feature debate and analysis from some of the most well connected reporters in the football world throughout the summer window.We will be digging into all the biggest storylines, both in the Premier League and around Europe, as we keep you up to date on all the latest developments.Join our host Pete Graves and his guests every week. Host Tom White is joined by Dharmesh Sheth and Pete Hall to discuss the fallout from another dramatic Deadline Day. They name their winners and losers and give their assessment on the clubs that secured the best business this January. Newcastle smashed their transfer record for the first time since 2005 with Miguel Almiron arriving at St James’ Park for £21m. But will that quell the fans’ discontent towards the ownership and convince manager Rafa Benitez to stay at the club? The panel debate whether the exit of Marouane Fellaini signals the start of a new era at Manchester United, while they discuss the importance of Anthony Martial signing a new contract. Finally, they look ahead to the summer transfer window and what the future may hold for the likes of Eden Hazard, Marko Arnautovic, Toby Alderweireld and Wilfried Zaha. Deadline Day winners and losers, will Almiron ease Ashley unrest at Newcastle and does Fellaini exit signal new era at Man Utd? Host Laura Woods is joined by Dharmesh Sheth and Pete Hall to discuss all the last-minute deals being done as the clock ticks down to Deadline Day. After Chelsea rejected a transfer request from Callum Hudson-Odoi, the panel discuss what else the club need to do to persuade the youngster to stay. Can Arsenal get deals for Ivan Perisic and Denis Suarez over the line? Our panel weigh in on that. They also discuss what Ole Gunnar Solskjaer needs to do to land the Man United job on a permanent basis and what Ed Woodward's priorities will be heading into the summer. We also have updates on Newcastle, West Ham, Southampton and Manchester City. Former Manchester United defender Jaap Stam sits down with Sky Sports News reporter Dharmesh Sheth to reveal all on his career. Stam discusses how a move to Old Trafford materialised and why he felt he was never ‘tapped up’ by the club. The former Netherlands international explains how his relationship with Sir Alex Ferguson deteriorated and why he felt the release of his controversial autobiography was not linked to his eventual departure to Lazio. Stam also reveals why he turned down the chance to return to Manchester when City boss Kevin Keegan came calling. Host Pete Graves is joined by Dharmesh Sheth and Nick Wright in the studio - but we go to France first, where Jonathan Johnson reveals the inside story on why Monaco have got rid of Thierry Henry (02:20), and how Paris Saint-Germain are planning a role for Arsene Wenger to have 'free rein' at the club (06:04). Raphael Honigstein explains why Borussia Dortmund are keen on Wilfried Zaha (16:30), and what is holding up Callum Hudson-Odoi's potential move from Chelsea to Bayern Munich (20:57). We hear from Ole Gunnar Solskjaer (38:55), Gianfranco Zola (43:52) and Rafa Benitez (48:30). Dutch football journalist Marcel van der Kraan explains why Barcelona have shelled out so much on Frenkie de Jong (52:00), and why Marc Overmars would be a good choice for Arsenal to replace Sven Mislintat (58:44). Host Laura Woods is joined by Dharmesh Sheth and Michael Bridge to discuss Sven Mislintat’s imminent departure from Arsenal and how that could affect the club’s transfer plans (01:14). Chelsea winger Callum Hudson-Odoi is set to reject a new £85,000-a-week contract – so will the Blues be pushed to sell him with less than 18 months remaining on his current deal? (09:48) The ongoing saga involving Marko Arnautovic took another couple of twists over the weekend – the panel discuss whether West Ham will continue to push ahead with a deal for Uruguay striker Maxi Gomez even if Arnautovic remains at the club (17:10). EFL expert George Elek joins the panel to chat about the five players that could make the step up to the Premier League in the near future (26:55), while MLS expert Andrew Wiebe gives us the inside track on Rangers target Matt Polster (35:47). How will Mislintat’s exit affect Arsenal’s plans, which five players PL clubs should be watching and is Hudson-Odoi on his way from Chelsea? Former Manchester City chief executive Garry Cook sits down with Sky Sports News reporter Dharmesh Sheth to talk through the rise of the club. Cook discusses the early financial troubles during his tenure and the arrival of multi-billionaire owner Sheikh Mansour. Cook reveals all the details behind City’s mega signings, from Robinho to Yaya Toure, and what happened during talks with John Terry. He also explains how they looked at bringing in Jose Mourinho to the Etihad and why Pep Guardiola was always in their sights. Italian football expert Adam Digby explains the reasons behind Maurizio Sarri's move for Gonzalo Higuain, the relationship the two share and how the Argentina striker will fit into the playing system at Chelsea (01:44). He also gives the inside track on Chelsea midfield target Leandro Paredes and analyses where Aaron Ramsey will fit in at Juventus. Could Tottenham dip into the market after losing Harry Kane to injury? Dharmesh Sheth assesses Mauricio Pochettino’s options (15:44). Is Uruguay striker Maxi Gomez the man to replace Marko Arnautovic at West Ham? South American football expert Tim Vickery explains what Gomez could bring to the Hammers and provides an update on Newcastle target Miguel Almiron (21:19). The panel go round the rest of the Premier League as we hear from Ole Gunnar Solskjaer, Unai Emery, Jurgen Klopp and Pep Guardiola (34:37). Are Sarri and Higuain the perfect match, will Tottenham sign a Kane replacement and why West Ham are targeting the next Luis Suarez? Host Laura Woods is joined by Dharmesh Sheth and Adam Bate to break down Atletico Madrid's move for Alvaro Morata and to discuss whether Gonzalo Higuain will be the man to replace him at Chelsea (1:28). Belgian football journalist Kristof Terreur joins the show to discuss Eden Hazard's desire to join Real Madrid (11:30), why Michy Batshauyi wants to join Monaco (13:02) and Arsenal's interest in Yannick Carrasco (15:02). The panel react to Petr Cech's retirement (19:25) , before discussing Marko Arnautovic's desire to quit West Ham for China (22:48) and whether the Hammers can beat off interest from Chelsea to sign Bournemouth's Callum Wilson as a replacement (24:25). Finally, Sky Sports News Northern reporter Tim Thornton joins the show to react to David Wagner's surprise exit from Huddersfield Town (31:40) and to discuss Leeds United's plans for the January transfer window (34:30). Chelsea's striker dilemma, is Real still Hazard's dream and can Arsenal land Carrasco? Host Dharmesh Sheth is joined by former QPR, Newcastle and Spurs striker Les Ferdinand for a special episode of Transfer Talk. The former England international reveals all about his playing career, including how a potential transfer to Man Utd was blocked. Ferdinand opens up on his move to Newcastle, his relationship with Kevin Keegan and why losing the Magpies number nine shirt hurt him. He also reveals why he regrets leaving St. James' Park and explains why his move to boyhood club Tottenham did not turn out as well as he had hoped. Spanish football expert Graham Hunter joins the show to discuss why Tottenham's Christian Eriksen is Real Madrid's priority summer target, and whether Chelsea's Eden Hazard may join him at the Santiago Bernabeu. There are also updates on the futures of Jose Mourinho, Neymar and Willian, as well as Manchester United pair Ander Herrera and Juan Mata. The panel discuss the pros and cons of Chelsea moving for Gonzalo Higuain and why the club must fight to keep Callum Hudson-Odoi. Also on the agenda is whether Marko Arnautovic could follow in Dimitri Payet's footsteps at West Ham. Why Eriksen is Real's priority, what is Neymar's next step and will Arnautovic follow in Payet's footsteps?